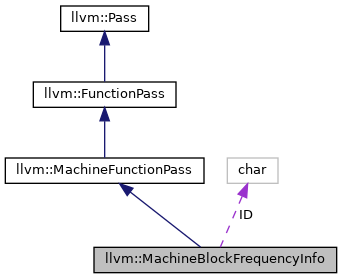 MachineBlockFrequencyInfo pass uses BlockFrequencyInfoImpl implementation to estimate machine basic block frequencies. Definition at line 33 of file MachineBlockFrequencyInfo.h. Definition at line 170 of file MachineBlockFrequencyInfo.cpp. References llvm::PassRegistry::getPassRegistry(), llvm::initializeMachineBlockFrequencyInfoPass(), and ~MachineBlockFrequencyInfo(). Definition at line 184 of file MachineBlockFrequencyInfo.cpp. References llvm::dbgs(), llvm::StringRef::equals(), llvm::MachineFunction::getName(), llvm::GVDT_None, PrintBlockFreqFuncName, PrintMachineBlockFreq, view(), and ViewMachineBlockFreqPropagationDAG. Definition at line 177 of file MachineBlockFrequencyInfo.cpp. Return 0 if we don't have the information. Please note that initial frequency is equal to 1024. It means that we should not rely on the value itself, but only on the comparison to the other block frequencies. We do this to avoid using of floating points. Definition at line 220 of file MachineBlockFrequencyInfo.cpp. Referenced by llvm::RegBankSelect::InstrInsertPoint::frequency(), llvm::RegBankSelect::MBBInsertPoint::frequency(), llvm::RegBankSelect::EdgeInsertPoint::frequency(), llvm::RegBankSelect::getAnalysisUsage(), llvm::LiveIntervals::getSpillWeight(), and giveUpWithRemarks(). Definition at line 224 of file MachineBlockFrequencyInfo.cpp. Definition at line 262 of file MachineBlockFrequencyInfo.cpp. Referenced by getNumAllocatableRegsForConstraints(), and llvm::LiveIntervals::getSpillWeight(). Definition at line 242 of file MachineBlockFrequencyInfo.cpp. Referenced by llvm::GraphTraits< MachineBlockFrequencyInfo * >::getEntryNode(), llvm::GraphTraits< MachineBlockFrequencyInfo * >::nodes_begin(), and llvm::GraphTraits< MachineBlockFrequencyInfo * >::nodes_end(). Definition at line 246 of file MachineBlockFrequencyInfo.cpp. Definition at line 231 of file MachineBlockFrequencyInfo.cpp. Definition at line 237 of file MachineBlockFrequencyInfo.cpp. Definition at line 251 of file MachineBlockFrequencyInfo.cpp. Definition at line 257 of file MachineBlockFrequencyInfo.cpp. Definition at line 210 of file MachineBlockFrequencyInfo.cpp. Definition at line 202 of file MachineBlockFrequencyInfo.cpp. Pop up a ghostview window with the current block frequency propagation rendered using dot. Definition at line 214 of file MachineBlockFrequencyInfo.cpp. Definition at line 38 of file MachineBlockFrequencyInfo.h.